As someone who is a full 50 percent Italian, I’m almost embarrassed to say that I’ve never made homemade meatballs…until now! We were making homemade pasta one night and the desire for meatballs and tomato sauce was too great to ignore. The recipe says to use a “light touch” when forming the meatballs. I’d say using medium pressure to form the meatballs works better because otherwise the meatballs fall apart when browning. Also, the recipe calls for a mixture of ground chuck and ground pork. I opted for only ground beef and thought the meatballs came out great. Next time I make this recipe (and there will be a next time) I’m going to double everything, or at least the sauce and maybe make the meatballs a little smaller. There were some meatballs and sauce left over, but not really enough sauce to make another pasta meal. Combine the bread and buttermilk in a small bowl. Let sit for 10 minutes, mashing occasionally with a fork, until a smooth paste forms. 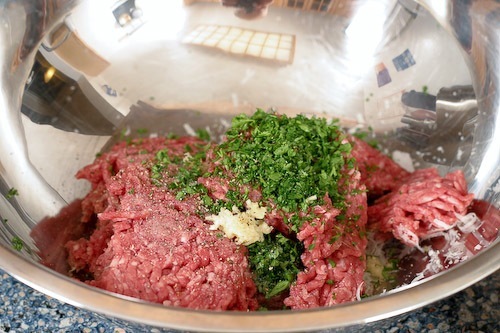 Place the ground meat, cheese, parsley, egg yolk, garlic, salt and pepper to taste in a medium bowl. Add the bread-mild mixture and combine until evenly mixed. 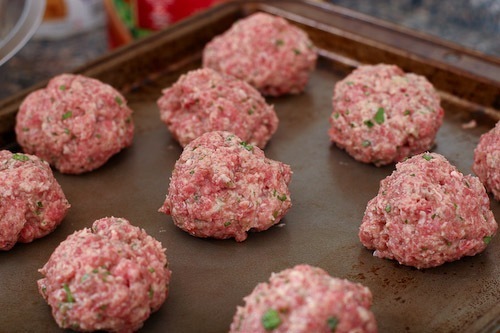 Shape 3 tablespoons of the mixture into a 1 1/2-inch round meatball. (When forming meatballs, use a light touch. If you compact the meatballs too much, they can become dense and hard.) You should be able to form about 14 meatballs. 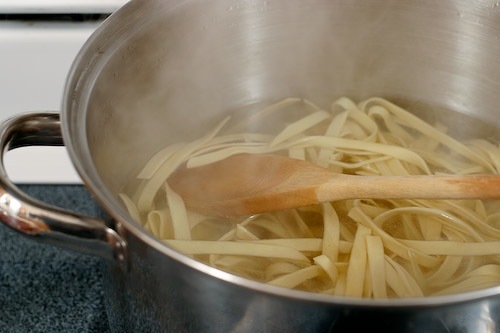 Pour the vegetable oil into a 10- or 11-inch saute pan to a dept of 1/4 inch. Turn the heat to medium-high. After several minutes, test the oil with the edge of a meatball. 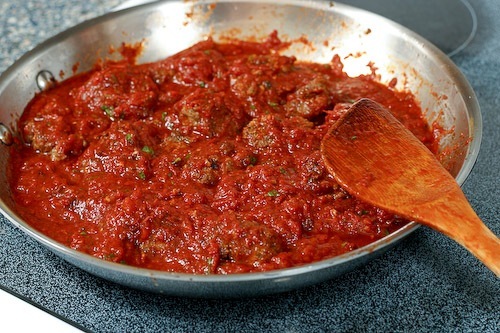 When the oil sizzles, add the meatballs in a single layer. Fry, turning several times, until nicely browned on all sides, about 10 minutes. Regulate the heat as needed to keep the oil sizzling but not smoking. 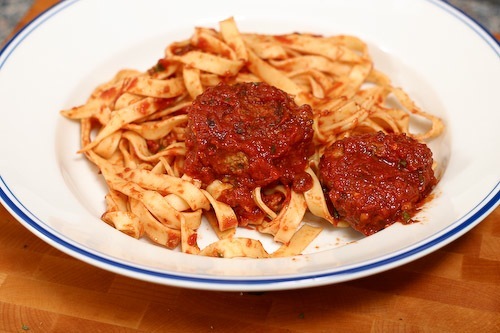 Transfer the browned meatballs to a plate lined with paper towels and set aside. Discard the oil in the pan, but leave behind any browned bits. Add the olive oil and garlic and saute, scraping up the browned bits, just until the garlic is golden, about 30 seconds. Add the tomatoes, bring to a simmer, and cook until the sauce thickens, about 10 minutes. Stir in the basil and salt and pepper to taste. 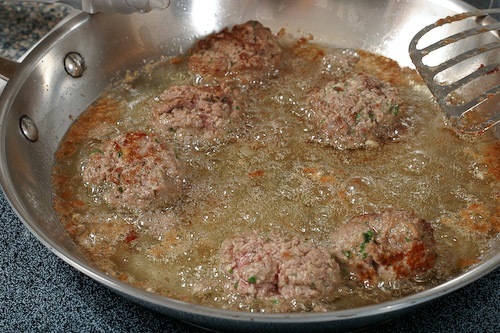 Add the meatballs and simmer, turning them occasionally, until heated through, about 5 minutes. Keep warm over low heat until ready to serve. *Make into balls – I make about 20 and freeze half to eat in a week or so. Then I don’t fry them, I just pop them into the sauce, which I have ready in a large pan and I simmer really gently for about an hour, stirring very gently occassionally. 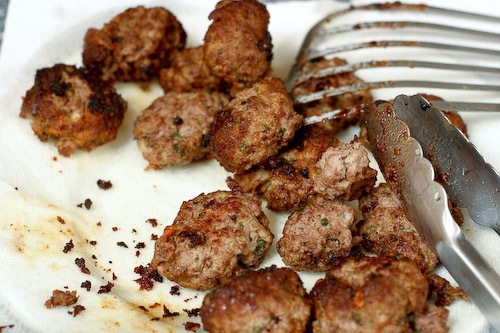 Really soft, delicious meatballs. With lashings of sauce too and I usually put in fresh chilli for a kick. Delicious! Hiya, just made some myself last night. I didn’t follow any particular recipe but based it on several that I had seen. Anyway, my meatballs stayed together fine and tasted delicious, so I must’ve done something right! About 1 lb or 450g of beef mince – good quality, mince, not the horrible fatty kind. And finally, I used crushed up crackers (about 5-10 whizzed up in blender/food processor) instead of bread. I squeezed them quite hard from hard to hand to form the balls, about the size of walnuts. I would think if you made them too big they would fall apart more easily. Also if the onion or cheese is too coarsely grated I imagine that would also cause them to break up. Few more tips: why not make your mixture, make one meatball and try frying that to see if it falls apart before you make the rest. Add more crushed crackers/bread if the mixture is too moist add a little more egg if too dry. Thanks James!! It sounds like a little experimentation is order. I am going to give your recipe a try and see if that solves things. I think squeezing them harder might be key! We had a similar problem. The meatballs were not staying together for us either. We pressed the second batch together more and that seemed to help. Let us know if you give it another try and figure anything out. 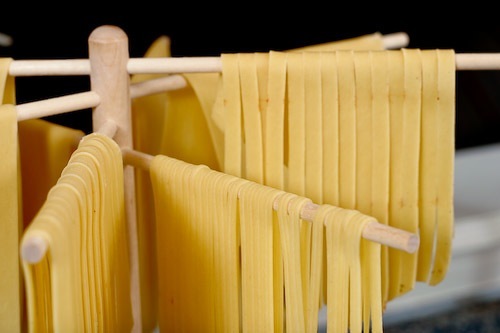 So so enjoy making homemade pasta. Thanks for the inspiring recipe and photos. Happy New Year.